Last Year, the Janssen Health Policy Centre launched the DiseaseLens™, a web application that provides the ability to analyse, from within a single dashboard, rich data on the most prevalent diseases including: Tuberculosis (TB), Diabetes, Hepatitis C, HIV, Schizophrenia, Depression, Alzheimer’s, Psoriasis, Ulcerative Colitis, Crohn’s disease, Multiple Myeloma and Mantle Cell Lymphoma, as well as widespread forms of cancer such as Prostate, Chronic Lymphoid Leukaemia and more. The data included in the DiseaseLens™ are regularly updated and come from across the most credible public sources including the World Health Organisation (WHO) and the European Commission. It is possible to explore and compare data of 20 diseases across 31 countries (Europe and Israel). 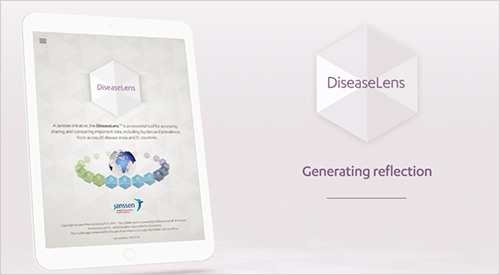 The Janssen DiseaseLens™ is now also available as a mobile app for both iOS and Android driven devices. You can download it from the iTunes App Store or Google Play. Simply key in “DiseaseLens” in the search bar and you can download it for free. With the Disease Lens on your mobile devices some of the most important data from 20 diseases across 30 European countries and Israel are now always at your fingertips. At Janssen we are looking forward to discussing with you what can be done to improve patient outcomes in these areas, or how we can complement these data more data. Watch the video to learn more about the app.